Cheval des Andes is a high-end wine project that’s a collaboration between (LVMH’s) Terrazas de los Andes and Pierre Lurton of Cheval Blanc. 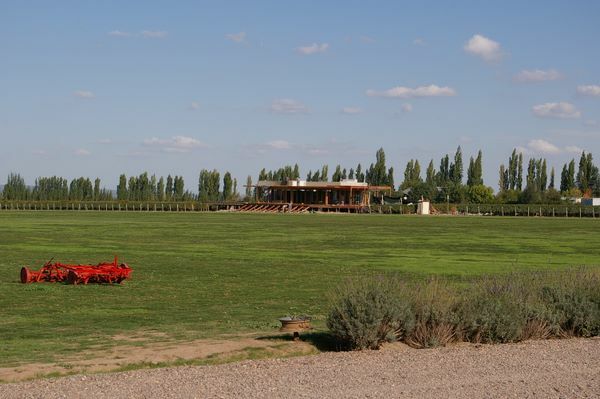 The joint venture was proposed by Pierre in 1999 when he realized the potential for top quality wines that existed in privileged sites in Mendoza. It was our first visit in Argentina, and we were welcomed by Nicolas Audebert, the young-ish French winemaker who has an illustrious track record, including spells at Veuve Clicquot and Krug, as well as his ongoing role at Cheval Blanc. Nicolas explains that while it might look strange that Pierre Lurton should come to Argentina to work with Malbec, before phylloxera Malbec was actually one of the most important grapes in Bordeaux. In 1855 when the famous Medoc classification was established, the Grand Crus all had 20–40% Malbec in their vineyards, and Cheval Blanc had a high proportion too. 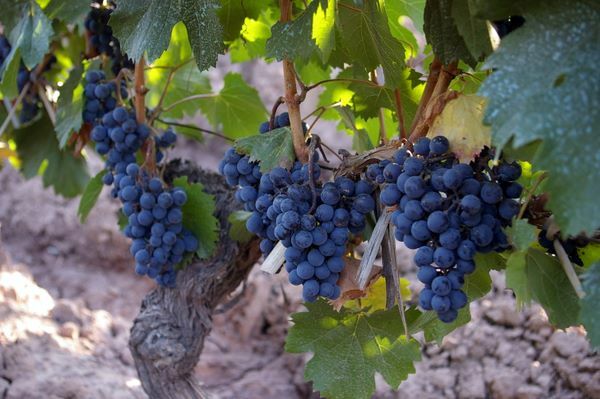 There were problems after phylloxera with bad selection of vegetal material and poor grafting, and so little by little Malbec was replaced by Merlot. 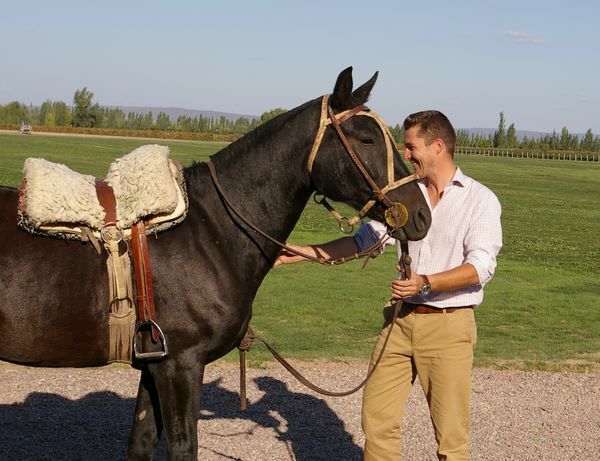 But Malbec has found a new home in Mendoza. Of course, Mendoza is very different to St Emilion. The Cheval des Andes vineyards are in a desert region at an elevation of 1100 metres. ‘It’s like making one wine on earth and the other on the moon’, says Nicolas. It’s because the terroirs are so different that Pierre embarked on a joint venture rather than going it alone: he wanted to make use of the local expertise. Cheval comes from around 50 hectares of vineyards: 36 hectares in Vistalba, which is the site we visited, and 15 hectares at La Consulta, 100 km to the south, but at the same altitude. Nicolas had some horses saddled up when we arrived, and the idea was we’d ride around the vineyard. I was the only one willing to give it a go; the others went round in a sort of pony trap. It was a nice, if slightly uncomfortable, way to get around. Nicolas is a very competent horse man and plays polo. At one point he galloped off to see how the others were doing; my horse made as if to follow, but a strong yank on the lead fortunately persuaded it to slow down again. The Vistalba vines are 80 years old, and are ungrafted. The vineyards are flood irrigated, and this helps deal with any phylloxera risk. With flood irrigation, it’s possible to simulate the effect of rain, with big doses: a little trickle would encourage the roots to remain close to the surface. ‘The biggest challenge is being able to balance the right phenolic and aromatic maturity without too high alcohol levels’, says Nicolas. ‘We are doing experiments taking out alcohol from the wine with reverse osmosis’, he reveals. ‘Everyone is doing this: we will typically take out 1%, but it’s an experiment at the moment’. 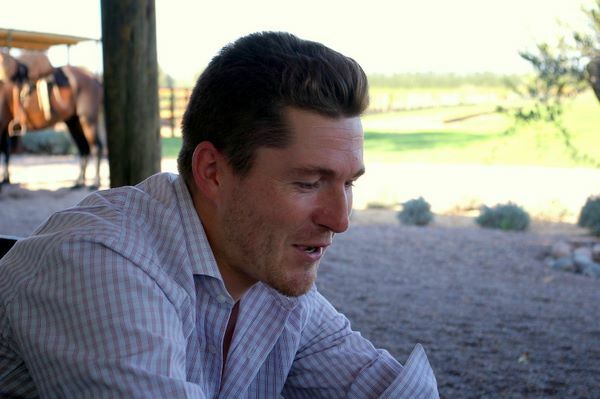 He adds that, ‘if it was authorized tomorrow, we’d do it on all the wines: I think it’s fantastic’. But he emphasizes that if they manage the vineyards properly they can get a good balance between the phenolic maturity and the alcohol, and there’s lots that can be done in the vineyard before they go to dealcoholization. 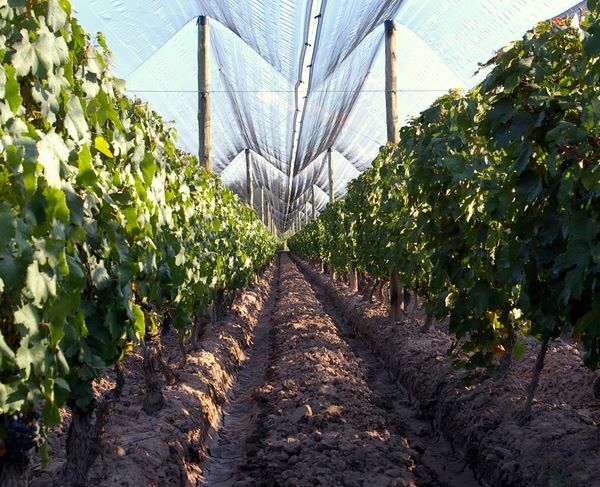 The vineyards are netted against hail (above). This is a very real threat here, but this netting isn’t cheap, costing around US$13 000. It’s currently six years old. Viticultural conditions here are quite benign otherwise, with low disease pressure and very few insect pests. We tasted two vintages: the 1999, which Nicolas describes as ‘too Argentine’, and the 2005.